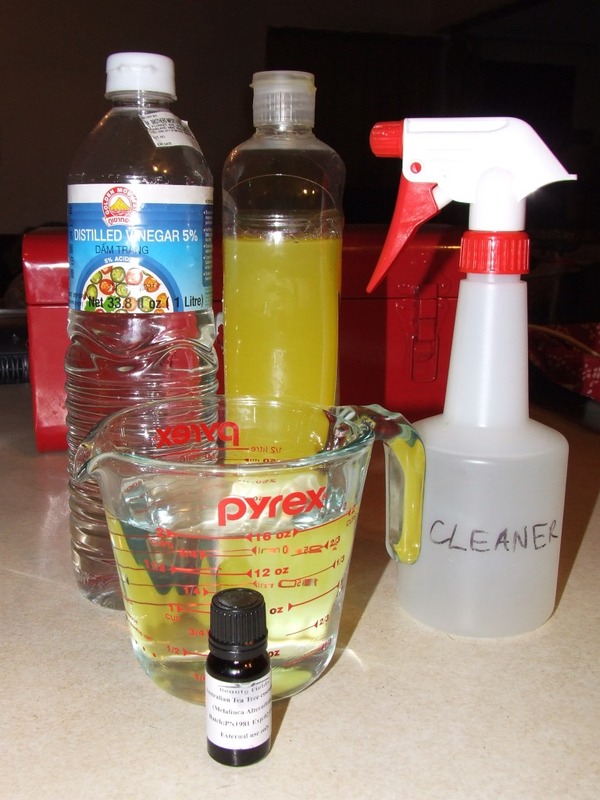 This kitchen disinfectant is another homemade cleaner I have tried out. And again, it was dirt easy to make. I took the ‘recipe’ from wikiHow: How to Make a Natural Disinfectant. Things to make kitchen disinfectant. You put the four ingredients in the spray bottle, shake it up and that’s it – ready to roll! The tea tree oil gives it quite a strong smell, but I like it because it smells natural. Now, what I really want is some sort of pine tree oil to give it, and every other cleaner I have, some pine scented goodness. I like pine trees. As a side note, we found our homemade dish liquid wasn’t quite cutting it (literally not cutting the grease), so we have been mixing it with a little bit of not-quite-so-bad commercial dish liquid from the supermarket. This seems to be a happy middle ground for our dish washing needs.